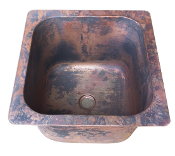 Cast Bronze Sinks: No Longer Available By Manufacture. Build In Copper! Choose From 16 Patina Finishes. Build To Any Size. Need Help With Your Order? Call Customer Service At 800-989-5166. Before Buying, Be Sure To Check Our Coupon Page For Our Lastest Sales Discounts!